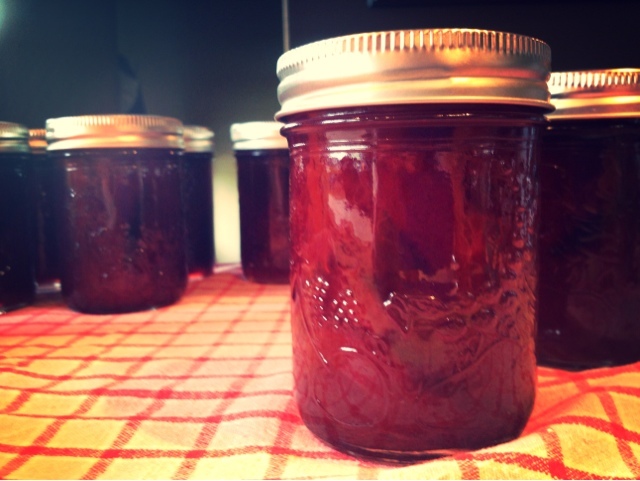 Pickles &amp; Preserves &amp; Pie Filling, Oh My! 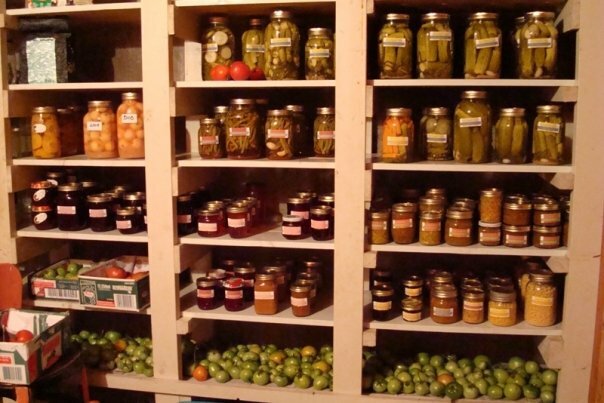 Pickles & Preserves & Pie Filling, Oh My! 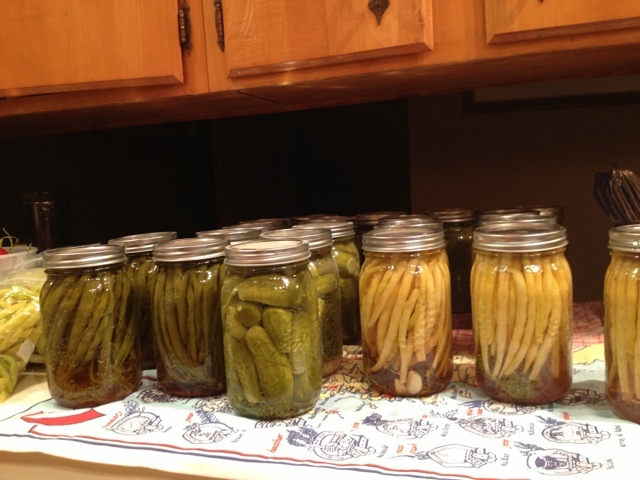 I love gardening, I love living off the land and I also love canning and preserving! I grew up in a home with a huge garden and the good example of a frugal, German-raised mother and Polish-farmer raised father. We kept things that could be reused, we didn't buy things that were unnecessary and, where possible, we lived off our farm as much as we could. We ate our own beef, chicken, eggs, vegetables and some fruit - cultivated and wild. My mother ground our wheat to make flour to bake all of our bread. We milked cows. We went to Oma's (my stalwart German grandma's) house every few months to make noodle together. I read every survival guide I could get my hands on. I learned to snare wild rabbits and prepare them for cooking. 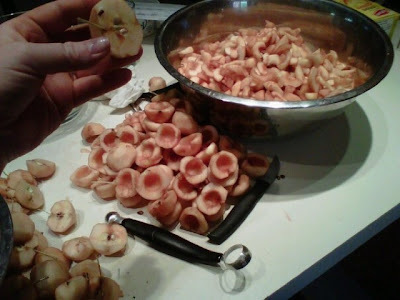 I loved foraging for wild mushrooms and berries, and I learned as much as I could about living off the land. We lived with what we had, and were proud to not have to shop for a lot of what we needed. I learned how to be a good farmer. I learned to respect nature and what it could give us, and what we needed to give back. My roots went deep into that prairie loam, and what it has given back to me is precious to me. As a direct result of this frugal, positive, hardworking focus during my upbringing, I still feel jubilant when I can provide for my family through my own sweat. For me, in many ways, that's what being a good wife and mother means. I get great fulfillment from growing and harvesting my garden; from continually educating myself on edible wild plants and gathering what I can; from creating something out of little, or out of something many people would pass by. For example, despite the pits and the processing time, when I hear that wild chokecherry jam is worth the work, I go for it! Of course it makes me glad to know that my family is eating organic, high quality food. But it's more than that for me. So I work to overcome obstacles and I persevere when I don't really feel like it. The finished product - the full freezer and cellar - makes me indescribably happy. Now that you've read my loony confession, would you like to read a few recipes? I've been a busy girl lately. This time of year is bursting at the seams with offerings from the earth, and I'm working hard to squirrel them away for the long, cold months ahead. This recipe is a two-day deal, so plan ahead! Makes 7 pint (500 ml) jars. In large pot, combine 8 c water, vinegar, 3/4 c salt, sugar and pickling spice. Bring to boil and stir to dissolve sugar and salt. Reduce heat, cover and simmer for 15 minutes. 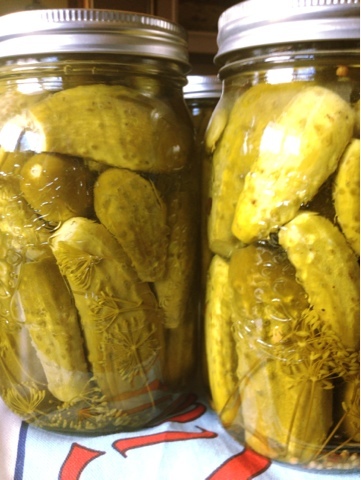 Pack one dill head, 2 (or more) garlic cloves, and 1 tsp mustard seeds to each of 7 hot (sterilized) pint jars. Rinse cucumbers in cold water (important! ), and pack into jars. Ladle hot pickling liquid into each jar to within 1/2 inch of the top. Screw on lids to fingertip tight, and hot water process for 10 minutes. My mother (and Oma's) variation on a classic. A hint of heat, and a different vinegar flavour, makes these a huge favourite. 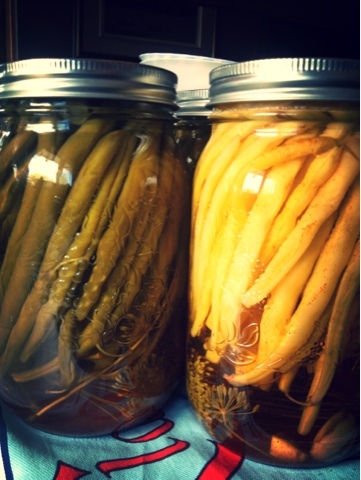 Makes 4 pint jars (I usually double it and use quart jars). Place a dill head, garlic clove, a 1/4 tsp of cayenne into each hot jar. 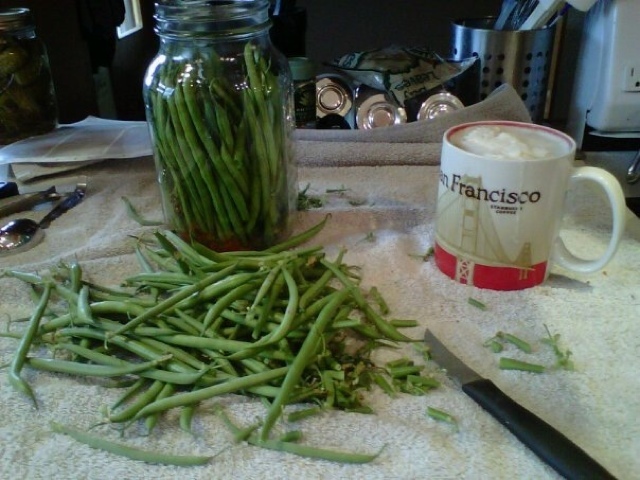 Pack beans into jars, stem ends down. Combine water, vinegar and salt and bring to boil, stirring until salt is dissolved. Ladle into jars to within 1/2". Simple and gorgeous. Use as a spread or as a dessert filling or topping. Makes 5 8 oz (250 ml) jars. Combine, boil over medium heat, stirring to dissolve sugar. Increase heat and boil rapidly until gel stage is reached. Ladle into jars to within 1/4". Heat process for 15 minutes. 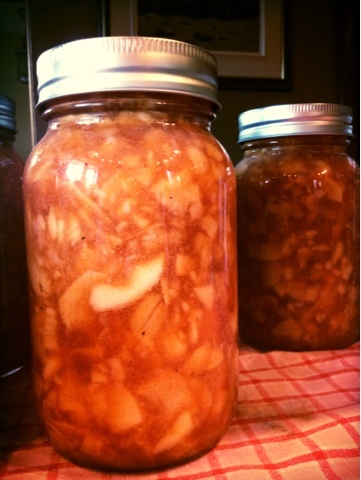 7 pint jars - I double it, as one quart jar fills a large pie very nicely. Blanch apple slices in boiling water for 1 minute, working in 6 c batches. Drain and cover to keep hot. In large saucepan combine sugar, starch, cinnamon, nutmeg, water and juice. Bring to boil and cook until mixture begins to thicken. Add lemon juice and boil for 1 more minute, stirring constantly. Remove from heat and fold in drained apples. Heat and stir until apples are heated through. Ladle into hot jars to 1 inch from top, wipe rims and screw on seals to fingertip tight. Heat process for 25 minutes.